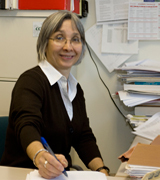 Dr. Melike Baykal-Gürsoy is an Associate Professor in the Department of Industrial and Systems Engineering. She received her BS and MS in Electrical Engineering from Bogazici University and her Ph.D. in Systems Engineering from the University of Pennsylvania. She teaches courses in optimization, stochastic processes, queueing theory, inventory control, process modeling and control, and time series analysis. Her research interests are in the areas of stochastic processes, Markov Decision Processes (MDPs), stochastic games, and their applications to stochastic modeling, optimization and control of transportation, telecommunication, and supply-chains. She is a member of INFORMS. Shridatt Sugrim, M. Sc., Applied Communication Sciences / Vencore Labs. Zhe Duan, Ph. D., Assistant Prof., Management Science Department, Xi'An Jiaotong University, China. Weihua Xiao, Ph. D., Research Associate, University of Arkansas at Little Rock. Muge Z. Avsar, Ph. D., Associate Prof., Industrial Engineering Dept., Middle East Technical University, Turkiye.